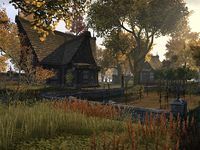 Aleswell is a settlement located north of the Imperial City along the Red Ring Road, in the Heartlands of Cyrodiil. During the Alliance War of 2E 582, Fort Aleswell was an expansive and strategically important fortress. It had its own farm, mine, and lumbermill, and was heavily fortified. It was initially held by the Daggerfall Covenant, although the keep changed hands many times over the course of the war as its central location made it essential for control of the Imperial City. 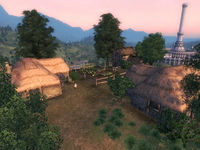 Before the war, a large village was also located at Aleswell, although the residents were evicted on pain of death by Grand Warlord Dortene of the Daggerfall Covenant. By 3E 433, nothing remained of the fort. That year, a Mages Guild wizard named Ancotar moved into the ruins of Fort Caractacus to the south. His experiments caused several problems for the local peasantry living in Aleswell, until ultimately he caused everyone in the area to turn invisible. Rumors soon began to spread about the villagers' mysterious disappearance. Fearing that the town would get a bad reputation for being haunted, the local innkeeper, Diram Serethi, approached the Champion of Cyrodiil for help. The Champion went to talk to Ancotar, although it is unknown if the invisibility magic was successfully dispelled. This page was last modified on 3 September 2018, at 00:06.